Bar Harbor is a town on Mount Desert Island in Hancock County, Maine, United States. Start off your visit on the 11th (Thu): head off the coast to Mount Desert Island and then see majestic marine mammals with a dolphin and whale watching tour. Get ready for a full day of sightseeing on the next day: identify plant and animal life at Shore Path, then make a trip to Land Bridge to Bar Island, and then take your sightseeing to a higher altitude at Cadillac Mountain. To see reviews, more things to do, ratings, and other tourist information, read our Bar Harbor planner . Appleton to Bar Harbor is an approximately 9.5-hour flight. Traveling from Appleton to Bar Harbor, you'll lose 1 hour due to the time zone difference. In July in Bar Harbor, expect temperatures between 75°F during the day and 58°F at night. Finish your sightseeing early on the 12th (Fri) so you can drive to Ogunquit. Start off your visit on the 13th (Sat): enjoy the sand and surf at Ogunquit Beach, then enjoy the sand and surf at Wells Beach, and then appreciate the extensive heritage of Marginal Way Walkway. To see ratings, reviews, photos, and other tourist information, refer to the Ogunquit trip builder . Traveling by car from Bar Harbor to Ogunquit takes 4 hours. Alternatively, you can do a combination of flight and bus; or do a combination of car, flight, and bus. 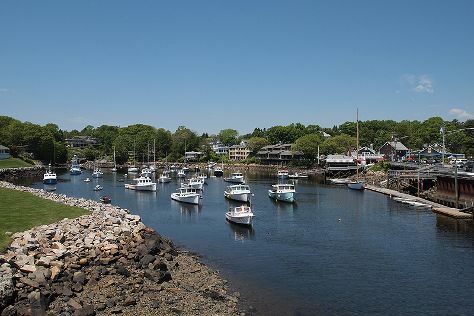 While traveling from Bar Harbor, expect somewhat warmer days and about the same nights in Ogunquit, ranging from highs of 81°F to lows of 58°F. Wrap up your sightseeing on the 13th (Sat) to allow time to travel to Phippsburg. Phippsburg is a town in Sagadahoc County, Maine, United States, on the west side of the mouth of the Kennebec River. Kick off your visit on the 14th (Sun): admire the majestic nature at Reid State Park and then enjoy the sand and surf at Popham Beach State Park. For where to stay, more things to do, traveler tips, and other tourist information, use the Phippsburg vacation website . Traveling by car from Ogunquit to Phippsburg takes 2 hours. In July, plan for daily highs up to 79°F, and evening lows to 59°F. Finish your sightseeing early on the 14th (Sun) so you can travel to Norwich. Norwich is a town in Windsor County, Vermont, in the United States. On the 15th (Mon), explore the galleries of Montshire Museum of Science, have fun and explore at Vermont Toy Museum, then make a splash at Upper Valley Aquatic Center, and finally snap pictures at Cornish-Windsor Bridge. To find where to stay, maps, more things to do, and tourist information, read Norwich online tour planner . Traveling by car from Phippsburg to Norwich takes 3.5 hours. In July, daytime highs in Norwich are 83°F, while nighttime lows are 59°F. Wrap up your sightseeing on the 15th (Mon) early enough to travel to Niagara Falls. Start off your visit on the 16th (Tue): admire nature's wide array of creatures at Aquarium of Niagara, Head underground at Cave of the Winds, and then admire the sheer force of Niagara Falls. Get ready for a full day of sightseeing on the 17th (Wed): enjoy breathtaking views from Niagara Falls Observation Tower, see the interesting displays at Niagara Falls Discovery Center, then head outdoors with Niagara Jet Adventures, and finally get curious at Niagara Aerospace Museum. To find photos, reviews, and tourist information, read Niagara Falls trip itinerary maker site . Traveling by car from Norwich to Niagara Falls takes 7.5 hours. Alternatively, you can fly. In July, plan for daily highs up to 81°F, and evening lows to 63°F. Wrap up your sightseeing on the 17th (Wed) early enough to drive to Grand Rapids. Kick off your visit on the 18th (Thu): admire nature's wide array of creatures at John Ball Zoo, admire the natural beauty at Frederik Meijer Gardens & Sculpture Park, and then meet the residents at Boulder Ridge Wild Animal Park. To see ratings, photos, more things to do, and more tourist information, you can read our Grand Rapids day trip site . You can drive from Niagara Falls to Grand Rapids in 6.5 hours. Other options are to fly; or do a combination of flight and bus. Expect a daytime high around 82°F in July, and nighttime lows around 61°F. Wrap up your sightseeing on the 18th (Thu) to allow time to travel back home.